Feathered clouds over the Mountain, a photo by The Bacher Family on Flickr. 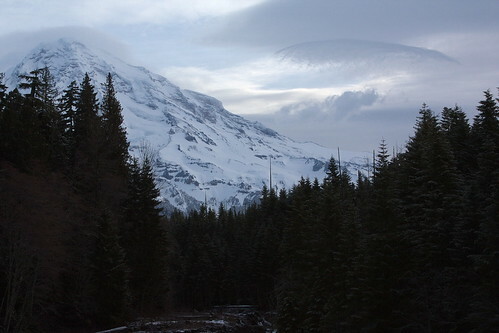 Mount Rainier is an endless source of images for a photographer. It changes with every inflection of light, and the clouds that enshroud it, blanket it, veil it, and dance around it are constantly changing. As I drive in to work each morning, and head for home each evening, I slow down and look over my shoulder at each viewpoint to see what the latest version of the Mountain looks like. This was the scene in early April as I headed in to work, with the morning light painting the Mountain in subtle pastels and a beautiful feather of a cloud hovering over its eastern flank.